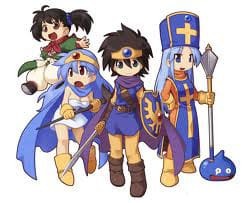 With Dragon Quest celebrating its 25th Anniversary, Square Enix have today announced plans to release a collection of classic titles from the series for Wii. All to be housed on one disc, fans will be able to enjoy Dragon Quest (Famicom), Dragon Quest 2 (Famicom), Dragon Quest 3 (Famicom), Dragon Quest 1&2 (Super Famicom) and Dragon Quest 3 (Super Famicom). Unfortunately no improvements have been made, with each game just being a direct port of the original now able to be enjoyed on the Wii. Wii Remote, Classic Controller and GameCube control schemes are supported. It’s due to release across Japan in September, with pricing yet to be announced. No word, as yet, of a planned western release.